SuperSync Server extends the capabilities of SuperSync to the NAS. By storing your music on a Network Attached Storage appliance, users can maintain a library of all their music, video and playlists on a device that is allows 24/7 access to the media. 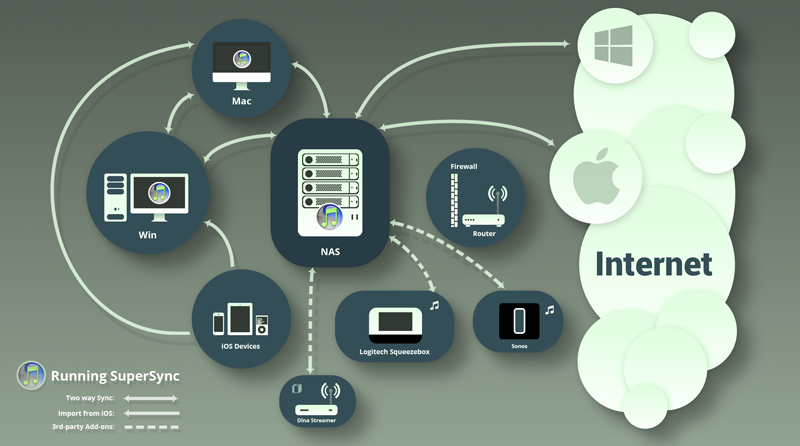 SuperSync Server is a single click, easy to install, add-on application available in your NAS to simplify the management of your iTunes libraries throughout your network. Seamlessly connect from your Macs, PCs, NAS devices to the SuperSync Server to sync, merge, transfer, compare your iTunes libraries and manage music & videos. SuperSync Server and SuperSync Desktop communicate smartly and intuitively with each other within your local network to automate and simplify your entire music management within the network. Connect from the Desktop SuperSync to the NAS SuperSync Server and you can instantly see which tracks are on the NAS, which are on your desktop, and which are in both and "synchronized". With a few clicks in SuperSync, you can move files and playlists to and from the NAS. Other NAS systems, including Drobo, Buffalo, and FreeNAS are in progress. Contact us if you have a need for additional platforms. Install SuperSync on your NAS and Desktop computer(s).